Acute Coronary Syndrome (ACS) refers to any condition attributed to obstruction of the coronary arteries which reduces blood flow to the heart, and includes unstable angina and myocardial infarction (MI). Although it is not included under the umbrella of ACS, stable angina is categorised within ischaemic heart disease. Temporary discomfort occurs from a chronic flow limiting lesion within a coronary artery and occurs when the demand for blood supplied to the myocardium is increased, for example during physical exertion or emotional stress. Clinical presentation, clinical history, electrocardiogram (ECG) and biomarkers are used to define ACS as follows which is summarised in the figure below. ST elevation myocardial infarction (STEMI) refers to ST segment elevation on a patient’s ECG who generally have cardiac biomarkers (i.e., elevated troponin level), which indicate necrosis of heart muscle. The pathway for clinical management focuses on early reperfusion therapy either by thrombolytic therapy or revascularisation with Percutaneous coronary intervention (PCI). Non ST segment elevation acute coronary syndrome (NSTEACS) refers to symptomatic individuals whose first ECG shows no ST elevation. Risk stratification occurs until a diagnosis of NSTEMI or unstable angina is made. These patients are stratified as low, intermediate or high risk in terms of adverse outcome. 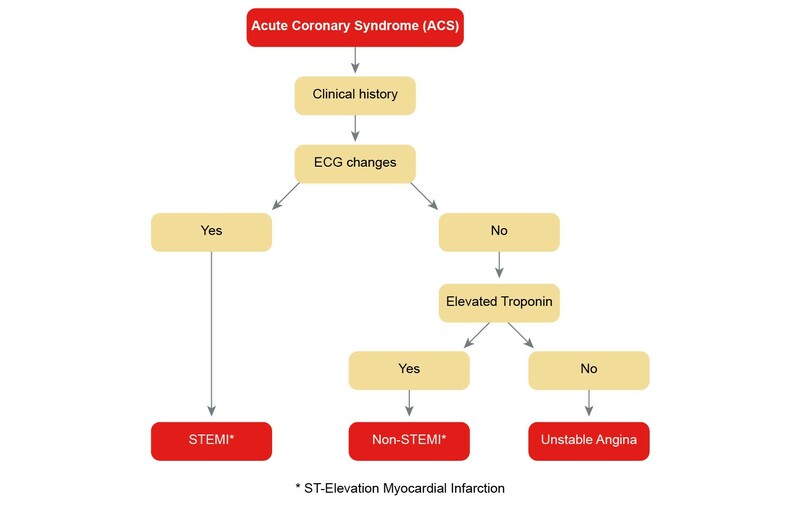 Non ST elevation myocardial infarction (NSTEMI) refers to those people who have not had ST elevation on their ECG, however, subsequent cardiac biomarkers are elevated. Up to 50% of patients diagnosed as NSTEMI have an ECG that is normal or only show minor changes. Unstable angina is an accelerated pattern of angina with or without ECG changes. It is distinguished from NSTEMI by the absence of elevated cardiac biomarkers. Ischaemia results from a reduced supply of blood and oxygen to the myocardium and is usually caused by a restriction or occlusion to at least one of the coronary arteries. The most common cause of ACS and sudden death is occlusion of a coronary vessel secondary to disruption of atherosclerotic plaque with subsequent thrombus formation. Non stenotic lesions are associated with plaque that has a core of lipid laden cells and a thin fibrous cap. These plaques frequently cause the most damage. They tend not to narrow the vessel lumen but instead are more prone to sudden rupture leading to thrombus formation that subsequently occludes the vessel. The clinical manifestation is infarction which is managed by drug therapy and lifestyle modification. [#chew-dp-aroney-cn-aylward-pe-et-al.-2011] A complete rupture of the fibrous cap of the plaque most commonly causes fatal MI. Myocardial cell death occurs within as little as 20 minutes as a result of prolonged ischaemia. Absolute necrosis may occur within 2-4 hours. The course of plaque development and progression is extremely complex and involves the interplay of multiple pathological processes. Management targets rapid reperfusion to prevent avoidable cell death, and thereby maintaining myocardial function as best as possible. Ischaemic symptoms vary from one individual to the next and may present in a variety of ways. This may include but is not limited to, discomfort in the chest, jaw, neck, back, scapular area, upper limbs or epigastric region. Symptoms may occur at a single site (e.g., chest only) or in various combinations (e.g., chest and upper limbs). They may also occur with exertion or at rest. The discomfort is typically non mechanical in that it is not increased or relieved with positional changes, and is often diffuse and not localised. MI is the end point of this ischaemia that results in heart tissue death due to absence of an adequate blood supply. Generally, discomfort associated with an acute MI lasts at least 20 minutes and it may be associated with breathlessness, syncope, diaphoresis, nausea and/or vomiting. Due to significant variation in symptoms, an MI may be misdiagnosed as a musculoskeletal, neurological, pulmonary, gastrointestinal, or psychological disorder. Occasionally, an MI may occur with no symptoms at all as a result of silent ischaemia. Diabetics and those who have had previous MIs are at significantly higher risk of silent ischaemia. Historically, women were often considered to have a lower risk of heart disease compared to men. Recent statistics however, show that heart disease is the leading cause of death for Australian women and 90% of women have at least one cardiac risk factor. More than 50% of women have two or more cardiac risk factors. Since ischaemic symptoms experienced by women often differ from those in men, women are often diagnosed at either an advanced stage of their disease or at the time of their MI. [#australian-institute-of-health-and-welfare-2010] As a result, public health campaigns are now more frequently aimed at improving recognition, diagnosis and management of heart disease in women. Heart failure (HF) is a debilitating condition that is characterised by shortness of breath, fatigue and exercise intolerance. Worldwide prevalence of HF has increased over the last 10 years with this trend expected to continue as the population ages. Despite significant advances in medical management, mortality is similar or higher than leading cancers and 12 month mortality for those with severe disease may be as high as 50%. Hospital admissions are frequent. Risk of readmission can range from 29-49% in the first 3-6 months following discharge, and within 30 days of discharge may be as high as 20%. [#rich-mw-beckham-v-wittenberg-c-et-al-1995, #westert-gp-lagoe-rj-keskimaki-i-et-al-2002] Many of these admissions are considered to be potentially avoidable. Multidisciplinary HF management aims to improve quality of life for the individual and prevent avoidable readmissions. See Treatment and management models of care for further information. HF is a clinical syndrome that can result from any structural or functional cardiac disorder that impairs the ability of the ventricle to fill with or eject blood at rest or during physical activity. Changes to heart muscle tissue and function, neurohormonal changes, and vascular and skeletal muscle function changes are often referred to as the “vicious cycle” of heart failure as illustrated in the figure below. The cycle commences with insult to the myocardium. Neurohormonal compensatory activities are triggered when cardiac output declines. The sympathetic nervous system (SNS) and renin-angiotensin-aldosterone system (RAAS) work to increase circulating blood volume through vasoconstriction and sodium and water retention. In the early phases of heart failure, natriuretic peptides such as brain natriuretic peptide (BNP) are released to counter balance the vasoconstriction by promoting vasodilatation and diuresis. In the long term, the ongoing effects of neurohormonal adaptation is counterproductive and maladaptive systemic alterations may occur in renal, vascular and skeletal muscle function. This contributes to further deterioration of cardiac performance. Renal impairment may be triggered by a decline in cardiac performance and major alteration in regional blood flow that can lead to a change in skeletal muscle function as seen by general muscle weakness. Deteriorating blood flow and impaired muscle function contribute to the signs and symptoms commonly seen. Left untreated, the process leads to remodelling of heart shape and structure and further reduction of cardiac output. Heart failure (HF) may be classified in several ways. When defined according to ventricular function, there may be impaired contraction (heart failure with reduced ejection fraction) or filling (preserved ejection fraction) or a combination of both. The New York Heart Association (NYHA) classification summarised in the table below classifies heart failure according to the individual’s symptoms and physical function. See also New York Heart Association (NYHA) classification. Heart failure with reduced ejection fraction (HFREF), which was previously referred to as systolic heart failure, occurs when the ventricle, in particular the left ventricle, cannot contract properly and fails to effectively eject blood resulting in reduced cardiac output, i.e,. left ventricular ejection fraction of less than 45%. This type of HF is the most responsive to pharmacological management. HFREF is most commonly caused by ischaemic or coronary heart disease resulting in inadequate oxygen supply or necrosis of heart muscle tissue secondary to infarction. Presence of hypertension is very common and can exacerbate the progress of HF. About 5-10% of HF is from non-ischaemic dilated cardiomyopathies. Other causes include cardiac valvular incompetence, uncontrolled chronic arrhythmias, viral cardiomyopathy, inflammatory cardiomyopathy, peripartum cardiomyopathy, alcohol related, medication related and thyroid dysfunction. See Causes of heart failure for further information. HF with preserved ejection fraction (HFPEF) results from impairment of the left ventricle to relax and therefore fill with blood. This type of HF is also referred to as diastolic HF or HF with preserved systolic function. HFPEF is commonly seen in elderly women and is associated with hypertension, coronary heart disease and diabetes. Other causes may include valvular disease, hypertrophic cardiomyopathy and restrictive cardiomyopathies such as amyloidosis. See Causes of heart failure for further information. Although HFREF and HFPEF may coexist, it is important to establish which is affecting cardiac performance as pharmacological treatment is different . See Medications for heart failure. No limitation of physical activity. Ordinary physical activity does not cause undue fatigue, palpitation, dyspnoea (shortness of breath). Slight limitation of physical activity. Comfortable at rest. Ordinary physical activity results in fatigue, palpitation, dyspnoea (shortness of breath). Marked limitation of physical activity. Comfortable at rest. Less than ordinary activity causes fatigue, palpitation, or dyspnoea. Unable to carry on any physical activity without discomfort. Symptoms of heart failure at rest. If any physical activity is undertaken, discomfort increases. Libby P, Theroux P. Pathophysiology of coronary artery disease. Circulation 2005;111:3481-3488. Australian Institute of Health and Welfare 2010. Australia’s health 2010. Australia’s health series no. 12. Cat. no. AUS 122. Canberra: AIHW. Rich MW, Beckham V, Wittenberg C, et al. A multidisciplinary intervention to prevent the readmission of elderly patients with congestive heart failure. New Eng J Med 1995;333:1190-1195. American Heart Association. Classes of Heart Failure. Mehmood Z, Naheed B, Irshad F, et al. Takotsubo cardiomyopathy:a possible metabolic disorder. Heart Metab 2014;62:36–40.